This is Mechanical project on "hydraulic bearing puller" and deals with design and fabrication of a hydraulic bearing puller, which is used for removing bearings from the shaft and the bearing cup with the help of a hydraulic. You can also Subscribe to FINAL YEAR PROJECT'S by Email for more such projects and seminar. First of all the bearing shaft is held between two fixtures. The hydraulic is passed to the direction control valve. The top fixture is moves up wards, so that the bearing is eliminated from the shaft. The hydraulic bearing puller and pusher perform both pulling and pushing operation safely and without harming bearing surfaces. The hydraulic bearing puller is used to getting rid of the bearings in the shaft by holding the bearing shaft in between two fixtures. One of the fixtures is movable and the other one is fixed. The principle of operation is the same as the conventional simple press. The difference is being only in the type of drive and the type of fixtures used. The following points exhibits why we've to make use of this type of press for removing bearings. Hydraulic bearing puller reduces the manual work. This type of machine reduces working time in removing bearings. By using this machine the bearings can be removed in the various lengths of shaft (up to 600mm). The hydraulic bearing puller is used to removing bearings in the shaft up to a length of 600mm. In the hydraulic bearing puller the main thing being the pressure developed is done with the help of a pump. The oil in that pump is passed to the cylinder. While the oil is surpassed to the valve, the specified velocity of the piston is received with the aid of adjusting its knob. When the oil is passed to the valve, the up/downward movement of piston is controlled by the hand liver. The bearing shaft is connected to the top fixture. A bottom fixture is fixed on the bottom plate by using bolts and nuts. We have added 2 project report in it. 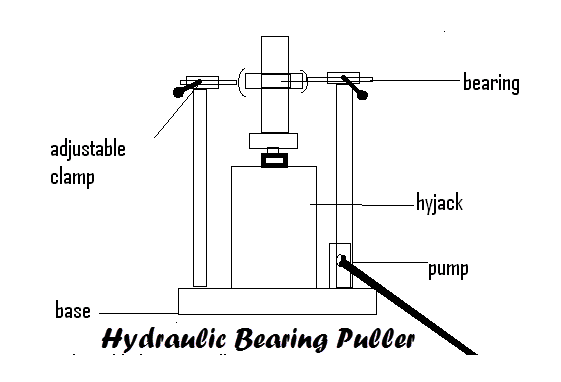 Use this project on "hydraulic bearing puller" for your reference and study purpose only.